This day is set aside to educate the public about caring for disabled pets, to feature disabled animals looking for a home and encourage animal lovers to consider a disabled pet when they are looking to adopt a new family member. You've seen it countless times, those cats in a shelter who are overlooked for various reasons. Tripod cats, one-eyed cats, deaf cats, cats with special medical conditions. I think Julie of Sometimes Cats Herd You said it best in our video, For the Animals, when she stated "they're not damaged goods at all!" Does this handsome blue boy look like damaged goods to you? We didn't think so! Which is why I love the term Specially-abled (or Differently-abled) and not Disabled. Because, although they may be different, they're not 'less than'. A cat missing an eye is not less lovable than one with both eyes. A cat who cannot hear can still feel your affection. 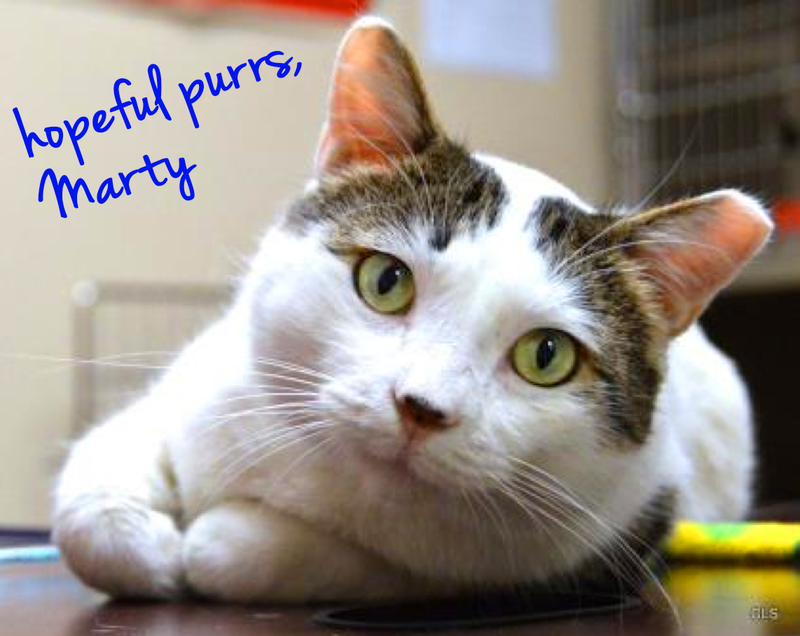 Sweet Marty was a Wayside kitty who found a loving home last year. His new family didn't care that he was FIV+. They saw past that to the love he has to give. By the way, FIV is not feline AIDS, despite what you may have been told -- even by your local shelter. A cat with FIV may be immune-challenged, but hey, so are a lot of humans, including me! We wouldn't consider a human who was deaf, blind or otherwise differently-abled to be less worthy. So why so we do that with cats? Or dogs? Or ferrets, or any other companion animal? As you know, Maxwell came to us as a cat with no eardrum, who was profoundly deaf. He's truly the sweetest cat I've ever been privileged to have in my life. And when the day comes that we're ready to adopt another animal - I'll look first at those who have lived the longest in a shelter. Would you walk past this adorable girl just because she only has three legs? Or perhaps it's because of the color of her fur. She's no less loving for that! The ones that, day in and day out, are walked past. Overlooked. But still capable or great love, affection and companionship. Won't you consider the same? We LOVE specially-abled cats! This is one of our favorite days of the year, when we get to remind everyone that cats like Maxwell and Ashton aren't "less than" at all. They're pawesome! Is the black kitty in the photo a Wayside kitty, too? The head peep is smitten with that gorgeous face. 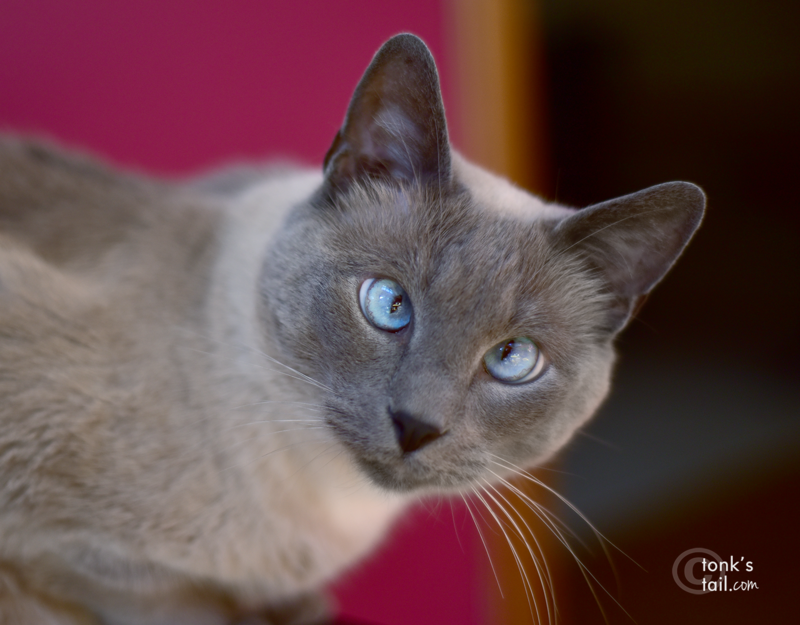 We hope more humans recognize that specially-abled cats make wonderful companions, too. Mommy's eyes are leaky now. Beautiful post on behalf of very deserving and sweet cats. You're so, so right. Up until Truffles and Mudpie I'd always adopted middle-aged to senior kitties. It breaks my heart that some cats keep getting overlooked. Great post! We have a beautiful furry black cousin who is a tri-pod and can she move! Mom also had a beautiful black kitty who was FIV+. One day people will understand that a beautiful soul shining through is just that, no matter the outside it is wrapped in. Our Leo was in a shelter for over three years ...it broke our Mama's heart that he had given up when she first looked into his eyes. But he eventually came around and spent the last four years of his life with us, cherished and loved. We hope the same will be true for many of these special and often overlooked kitties. Lisa, a little birdie told us it was your birthday.Happy Birthday! We hope your special day is as special as you. It's so important that the specially-abled kitties get seen for the exceptional cats they are. No kitty is ever less than! We're glad to see specially-abled kitties being recognized for the purrfect kitties they are! We couldn't agree more and all kitties are purrfect and deserve the love! Super post! No kitty is less than any other!! One of our good dog buddies lost a front leg a couple years ago, but he still gets around like a champ! None of them would be overlooked on my watch, trust me. If we take another on, it will be differently abled. PS I think we shared your video from last year way too early - right? Very nice post. Two of my cats were in the shelter for 2 years which is why I adopted them. Great post! TW adopted Autumn b/c she was one toe short of a full foot. I'm less adoptable cos I bite. TW said next time she'll look for a one-eyed stool cat who is a lap cat. For sure the next time I adopt it will be the ones who have been waiting the longest. I have set my mind to that already. Specially abled cats are awesome. We adopted our housepanthers, Gracie and Zoe, after they had been at the shelter for years. They are loving and amazing and special! We didn't know of this day...but now we do, and we would not pass over so called different kitties...come time to adopt another one into our furmily...or a doggy fur that matter. that last photo, she has beautiful eyes! it is sad what people will outright dismiss. I let my cat adopt me when I saw that he was 10 y.o., black and had behavior problems including litter box issues. That was 3 years ago and he has been one of the most loving and best behaved cats I have ever had. There has never been one single litter box accident and he displays his love and gratitude in ways that that I have never seen another cat do. I saw his photo on the shelters website and knew he was coming home with me then. Since then he has been one of the best friends I have. Joseph, that's such a wonderful story! So many cats suffer "bad behavior" when it's really the bad behavior of the previous owner (e.g. litterbox issue -- who would want to use a sewer for a restroom? So many people don't clean out the litter often enough, and cats' sense of smell is 14 times more sensitive than our own!). Plus, the stress of shelter living often makes it appear a cat has "issues" that are simply stress related and so often disappear when in a home environment! 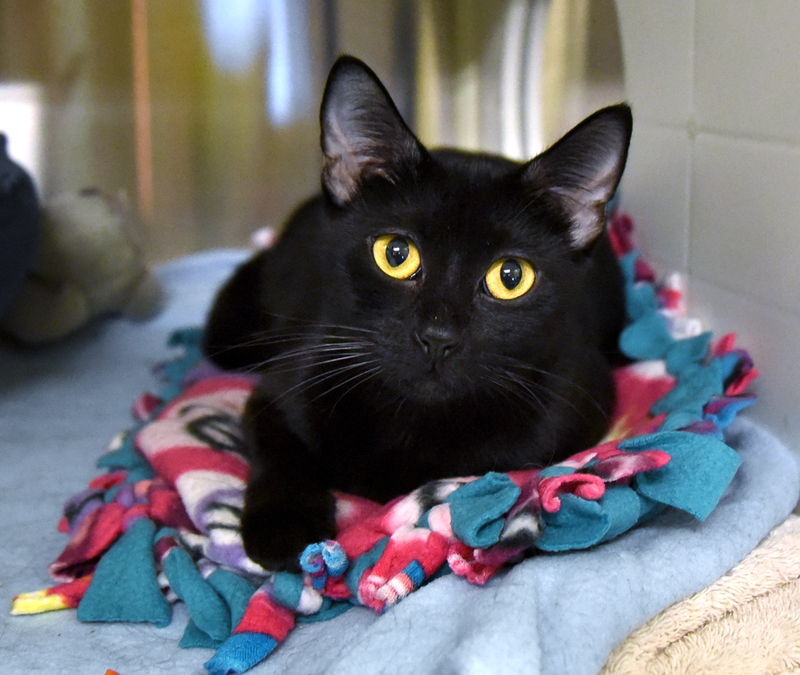 Thank you for sharing and for adopting your wonderful black housepanther!